Honest. 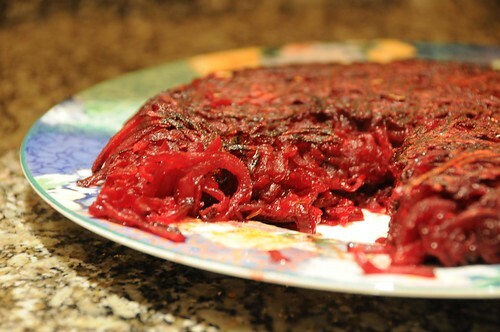 My kitchen did look a little like I’d some some slaughtering, but the only things harmed were beets. I tend to get in a beet rut. They’re just so good roasted that I find it difficult to work up the motivation to try any other methods. But my winter farmshare has provided enough of a bounty that even I felt compelled to branch out, and this recipe, which is dead easy with a food processor to do the grating for you, proved totally worthwhile. 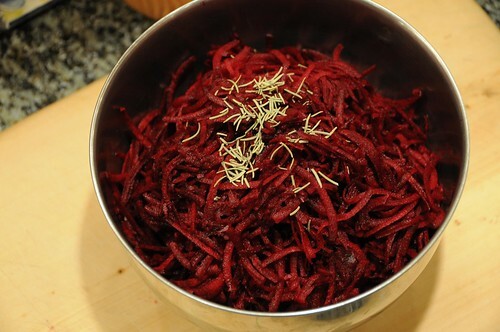 Trim the ends off the beets and peel them with a vegetable peeler, then grate either by hand or in food processor. 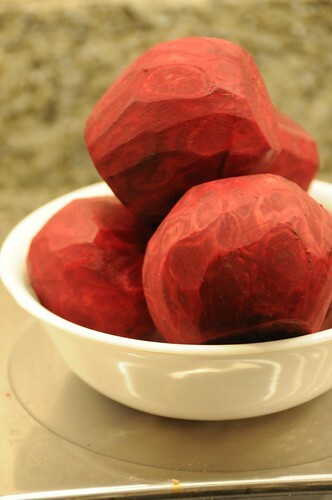 Mix grated beets, rosemary, salt, and flour in a large bowl and toss well to combine. The flour will get sticky from the water in the beets, so having a really big bowl is helpful here. Melt 2 tablespoons of the butter in a skillet over medium heat. Add the beet mixture and press it down to form a cake. I used an 8-inch skillet, but you could use a bigger one if you don’t mind a thinner cake. Cook for about eight minutes, until the bottom is crispy and browned. If you’re using a small skillet, I suggest cooking it covered for the first couple of minutes, just so the beets all get cooked through. Then cover the skillet with a plate and flip the cake out. Melt the remaining tablespoon of butter and slide the cake back in, cooked side up, and cook for another eight minutes or so on the other side. Flip again on to a plate, slice, and eat! I liked it sprinkled with a little extra sea salt or some crumbled feta.